This shows the details better than the photo, though admittedly it’s rather less spectacular. 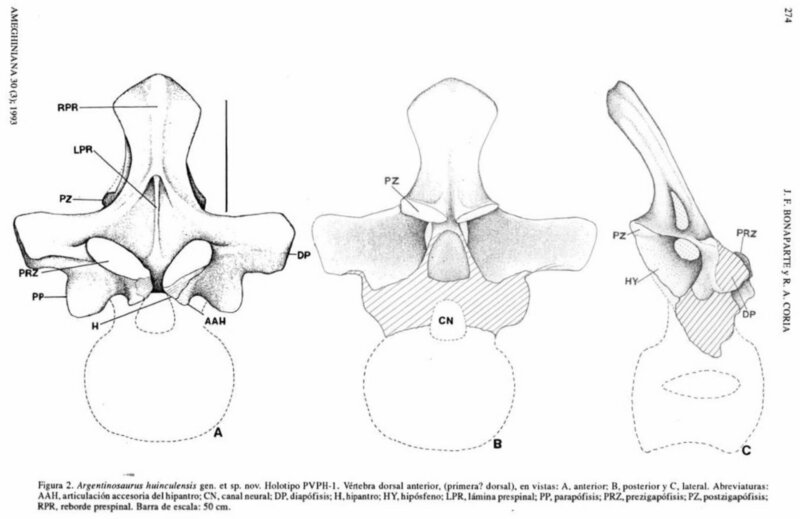 But what’s most noticable, to me at least, is that the centrum and the lower part of the neural arch is completely missing … which means that the “hypantrum” of the reconstructed vertebra in the photo that Darren used is pretty much a complete fiction. Or let’s be more charitable and say “involves a certain amount of interpretation”. At this point, I am going to stop (A) posting all the figures from Bonaparte and Coria 1993, and (B) pontificating … at least until I’ve read Apesteguía (2005) which — for shame — I haven’t, yet. Well, it’s a truly frightening piece of work. References are the same as for Darren’s post. Shame on you indeed. I’ve read Apesteguía’s paper three times now. Am I joking? You can decide. But thanks for chasing this up.. and ending up about as confused as I was I think. 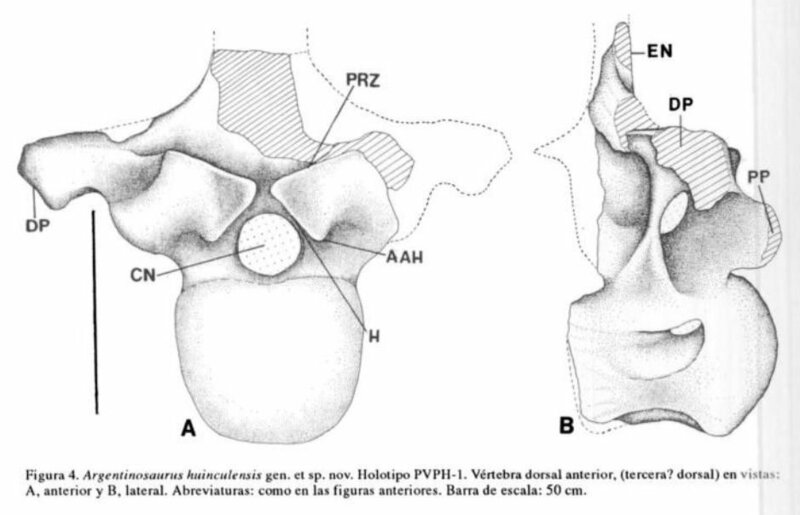 OK, my New Year’s resolution for 2008 is to read the sodding hypantrum paper — the whole thing. Check back on January 1st 2009 to see how I got on. But really, I think the answer to the question “does Argentinosaurus have hypantra” comes down to the rather boring answer “it depends what you mean by hypantra”. Good figures of the posterior dorsals would help to resolve that (or, better still, a travel grant to go and look at the material). My New Year’s resolution was to figure out what the heck a read hypantrum looks like. Fortunately, the first google images hit did the trick. Now, if I can just figure out how to work it into ordinary conversation I’ll be the envy of all my friends. Oh yeah? Do a Google search for ‘headless butterflies’ (plural). Oh yeah? Try googling “beef casserole”. Yeah, on google.co.uk maybe. ‘Cuz this is my United States of…WHATEVER! Ok ok, I’ll give both of you that one. After all, we all know that headless butterflies and .. beef casseroles are waaaaaay more interesting that hypantra. I hear applause – thank you, thank you..